It’s very close to Halloween! 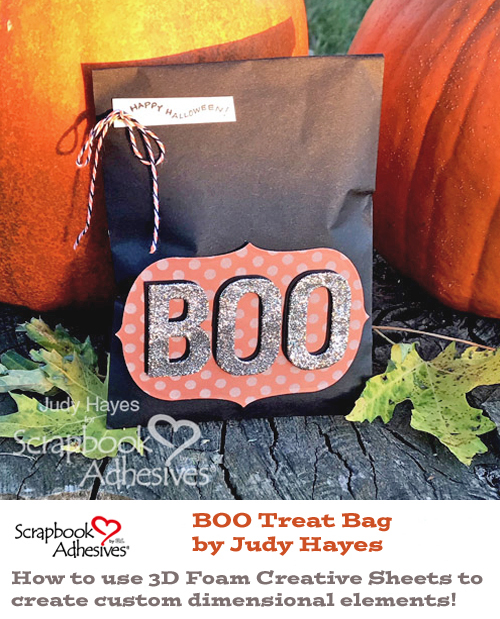 Why not make a quick BOO Treat Bag for a friend, neighbor or Trick or Treater! Let’s make several of these easy and quick bags! Die cut “BOO” letters from 3D Foam Creative Sheets in Black. Peel liner from the front of the letters. Cover with glitter and press into the adhesive. 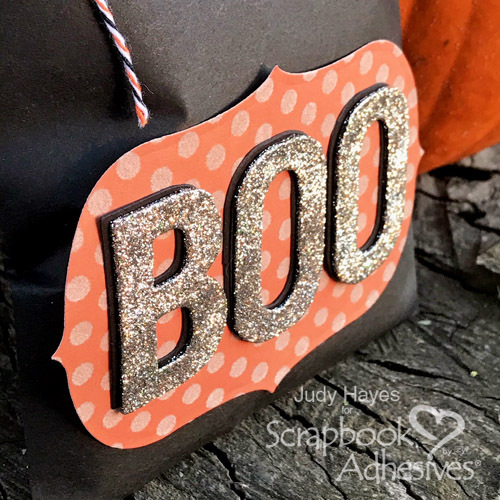 Die cut “BOO” letters from black cardstock. Peel liner from 3D Foam Creative letters. Fasten over black cardstock letters with a slight offset to give a shadow effect. Use E-Z Runner® Micro Refillable Dispenser to apply adhesive to the back of the letters. (E-Z Runner® Micro Refillable Dispenser applies a narrow adhesive strip. Great for these letters!) Fasten letters to the treat bag. That’s it! The only thing left to do is fill with treats! 3D Foam Creative Sheets are one of my favorite things to die cut! They cut easily and give dimension! 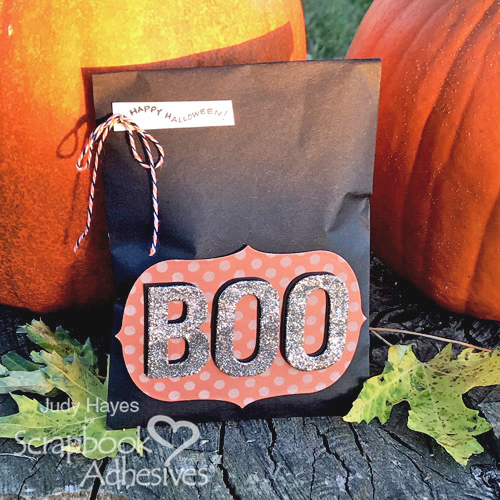 With adhesive on both sides, it’s so easy to add glitter or paper to one side and fasten them with permanent adhesive on the back. This entry was posted in 3D Foam Creative Sheets, Adhesives, Beginner, Crafts & Tutorials, E-Z Runner® Dispensers, Fall, Gifts, Other Adhesives, Party Favors, Permanent Adhesive, Seasonal Craft Ideas, Skill Level, Tutorial, Wear your Adhesive on the Outside and tagged 3D Foam Creative Sheets Black Small, 3D Foam Creative Sheets Mix, Adhesive Dots Micro, Bakers Twine, E-Z Runner Micro Refillable Dispenser, E-Z Runner Ultra Refillable, Glitter, Halloween, IMAGINE Crafts/Tsukineko, Judy Hayes, KaiserCraft, Ranger Ink, Spellbinders Paper Arts, Tim Holtz, Treat Bag, Wear Your Adhesive on the Outside. Bookmark the permalink.